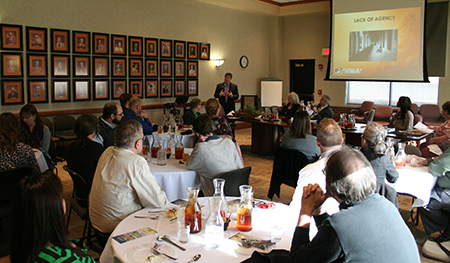 Speaking on the state of education in Arkansas City, Cowley College president Dr. Dennis Rittle served as a keynote speaker during the Arkansas City Chamber of Commerce noon networking luncheon held Tuesday, Dec. 1 in the President’s Private Dining Room on the Cowley College campus in Arkansas City. Sydney Bland, director and CEO of the Arkansas City Chamber of Commerce, said the purpose of the quarterly noon networking luncheon is to have speakers who can give the latest information on topics that affect individuals every day, such as education, the city, the county and the state. Along with Dr. Rittle, Dr. Ron Ballard, USD 470 superintendent, also served as a keynote speaker at the event which was sponsored by the Best Western Plus Patterson Park Inn. Dr. Rittle and Dr. Ballard spoke about the underlying issues of education that affect individuals every day. The quarterly noon networking luncheon is not only for chamber members, but also those interested in the betterment of the community.